The good news: this Dark Web isn’t searching for your credit card info. 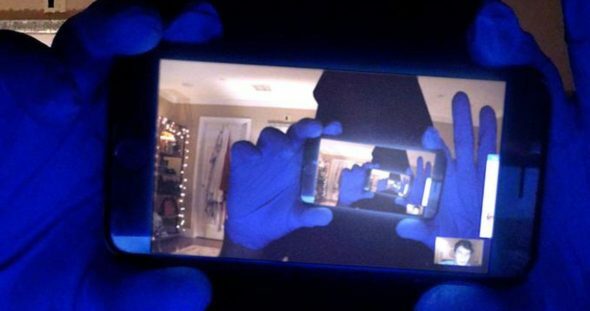 That would be playing nice compared to what the sequel to the surprisingly effective Unfriended has in store. More good news: it’s mean is pretty damn lean, clever and creepy. Like its predecessor, Dark Web does a great job upholding the integrity of the “real time computer screen” gimmick. But from the opening setup, this one carries more eerie authenticity. First-time director Stephen Susco, a veteran writer with plenty of horror titles in his resume, knows the genre has always reflected the anxieties of the day, and his screenplay here feels as in-the-moment as a brand new laptop with all the latest add-ons. That’s what the kids, say, right? There’s some bad, bad, stuff on that hard drive, and Matias has to strike bargains with the bad guy if he wants his friends to survive the night. Sure there are some preposterous turns, but as the upper hand shifts (and shifts again), Susco and his winning cast (including Blumhouse favorite Betty Gabriel) make it a suspenseful ride. We’re making these discoveries right along with them, and while true scares might be in short supply, there’s is no shortage of nasty and unpleasant. As online cautionary films go, Dark Web gets it better than most. The original Unfriended debuted four years ago, or in tech/social media terms, the Stone Age. Susco finds a wry, self-aware groove to drive home just where we’re at today: manufactured reality, “swatting,” and even, yes, internet currency. Word is, there will be two theatrical prints, each with different endings. I can think of one that would pretty well spoil all that Dark Web executes so well. I didn’t see an ending like that.